Hey student in Penang! 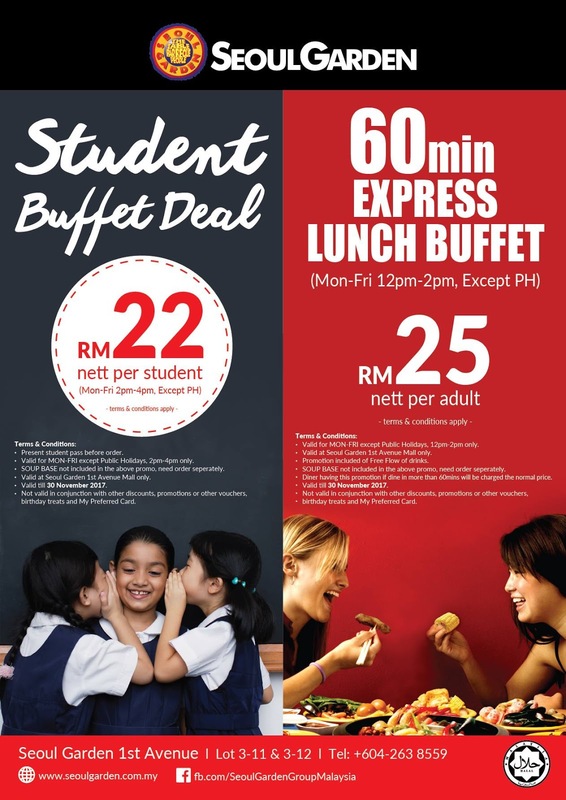 Student buffet deal at RM22 nett only!😍 Monday to Friday 2PM - 4PM except public holiday. Didn't hold any student card? don't worry! Let's enjoy 60 min express lunch buffet with your colleagues during lunch time at RM25 nett per adult. Monday to Friday 12PM - 2PM except public holidays. Valid at Seoul Garden 1st Avenue Mall only. Have you grab this voucher yet? Hurry up! RM8 voucher for Seoul Garden 1st Avenue Penang! Voucher valid on everyday except Public Holidays. Customer must present this coupon prior to ordering.